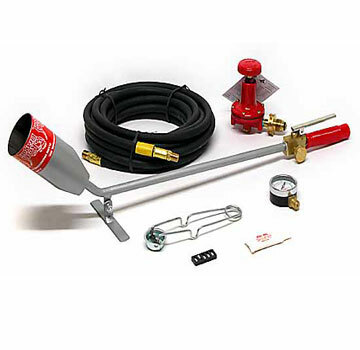 PRODUCT: Flame Engineering Red Dragon RT-2-1/2 20 C (400,000 BTU) Roofing Propane Torch Kit. Price/Kit. DESCRIPTION: The work horse of all Red Dragon roofing torch kits, the RT 21/2-20 C performs stand up work with ease and is noted for durability and efficiency on the job. This kit excels in balance and flame control. The 29" length torch provides excellent balance and flame control. Also available in a lightweight model. PROPANE FEMALE QUICK-DISCONNECT, 1/4 in. FPT, HIGH PRESSURE TYPE. FOR PROPANE HOSE AND TOOLS. PRICE/EACH.